Best things to do with the family at Christmas! Christmas is just around the corner and there are so many activities in and around Vancouver that will get you in the holiday spirit! Here is a list of my favourite kid-friendly events for the whole family to enjoy. The top of Grouse Mountain has a ton of Christmas fun. With the beautiful lights, the snow on the ground, ice skating on the mountaintop pond, and (the best part of the day) a horse-drawn sleigh ride. You can even take the kids to meet Santa! There is also crafts available and movies so you can warm up inside. All of these activities are free with the purchase of a mountain admission ticket. It’s one of my favourite stops of the season! 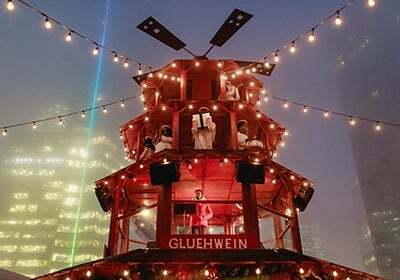 Also known as the German Christmas Market, this is something I do every year with the kids. With more than 80 vendors with German sweets, treats, and treasures. There are plenty of events and activities, and a lot of amazing shops so you can grab last minute gifts and beautiful souvenirs. I always make sure I grab gluhwein, schnitzel, pretzels and doublezouts for the road! Taking a trip out to Stanley Park is always a great day trip. This train ride takes you around the park and gives your incredible light displays, amazing scenes and live performers along the way. With over 3 million lights it’s guaranteed to be a good night. Also a portion of the sales from your ticket goes towards the BC Professional Fire Fighters Burn Fund. Get out with the whole family for a completely unique Christmas experience. This is another Christmas Fair, but this one is in an incredible 17,000 sq.ft. Edwardian mansion. Every floor if this home is covered in fantastic decorations and also features local artisans. Come by with the family and be in awe of all the magnificent and gorgeous décor. No list would be complete without the Capilano Suspension Bridge light display. The bridge, the treetops adventure, and Cliffwalk all are decked out in thousands of lights. Sometimes it can get quite cold out there so triple-layer, but with such fantastic sights and magical moments on the tallest Christmas tree in the world, it’s hard to pass up. With all these options for your children young and old, you can expect a fantastic day out while feeling extremely festive. Happy Holidays from my family to yours!